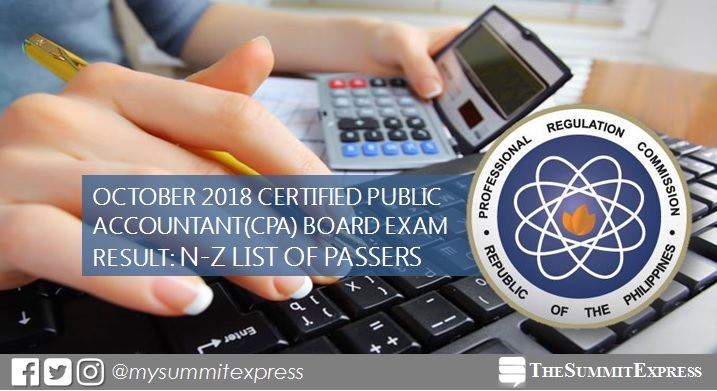 MANILA, Philippines – The Professional Regulation Commission (PRC) releases results of October 2018 Certified Public Accountant (CPA) board exam, together with the official list of passers, topnotchers (top 10), top performing schools and performance of schools on Monday, October 22 or in six (6) working days after the exam. PRC administered the CPA licensure exam in the cities of Manila, Baguio, Cagayan de Oro, Cebu, Davao, Iloilo, Legaspi, Lucena, Tacloban and Tuguegarao on October 6,7 and 13, 2018. View on this page for N-Z alphabetical list of passers. NOTE: The Summit Express will also update this site for the list of conditional examinees once released by PRC. CPA board exam's verification of ratings (passers, non-passers and conditional) can be done online. According to PRC Resolution No. 2017-1068, the target release of October 2018 CPA board exam results is on Monday, October 22 or in six (6) working days after the exam. Note that results may be released online ahead or beyond the schedule without prior notice. We advise takers to monitor announcement of results starting this week. Monitor this page for the real-time updates on Accountancy board exam results. Check out also the official website of PRC (prc.gov.ph) for more information.